Well, my home garage is in need of a repaint inside. I'm lucky that the place was finished when we bought the house, so all the walls were already dry-walled and lightly textured with the same knock-down coating as the interior walls in our house. However, it's time to repaint. I'm considering doing some sort of stripe or color scheme rather than the straight white, but I don't want the place to end up looking silly. 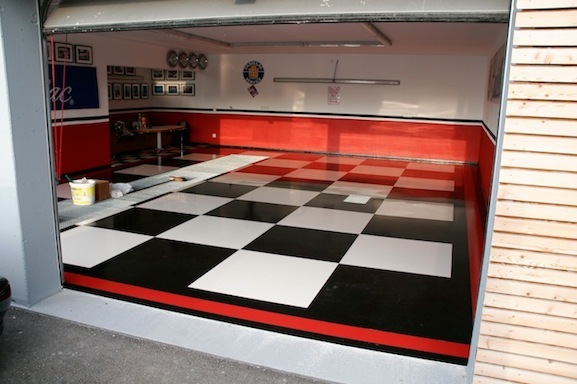 The cars that live in the garage are both red, and I have some black items like the tool box, fridge, etc., so I am thinking maybe a red / white / black and maybe gray scheme. The floor is natural concrete at this point, and I don't have a huge desire to coat it, because I kinda dig the gray neutral and naturally random concrete color pattern. I saw this, I'm not sure if it's too much. Thoughts?